Learn how to create an iOS book open animation including page flips, with custom collection views layout and transitions. In Part 1 you’ll learn how to customize your collection view layouts and apply depth and shadow to make the app look realistic. In Part 2, you’ll learn to create custom transitions between different controllers in a sensible way and integrate gestures to create natural, intuitive transitions between views. This tutorial is for intermediate to advanced developers; you’ll be working with custom transitions and custom collection view layouts. If you’ve never worked with a collection view before, start with some of our other iOS tutorials first. Note: Full credit goes to Attila Hegedüs for creating this awesome sample project. Download the starter project for this tutorial here; extract the contents of the zip file, and open Paper.xcodeproj in Xcode. The app is pretty much fully built; you can scroll through your library of books and select one of your favorite books to view. But when was the last time you read a book which had its pages side-by-side? 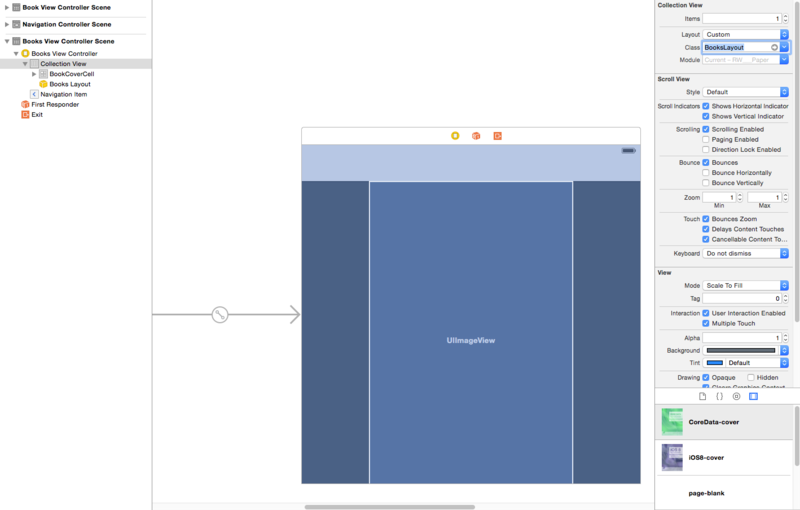 With a bit of UICollectionView know-how, you can dress up the page view quite a bit! Books.plist contains sample book data. Each book contains an image cover along with an array of images to represent pages. BookStore.swift is a singleton that is only created once in the life cycle of the app. The BookStore’s job is to load data from Books.plist and create Book objects. Book.swift is a class that stores information related to the book, such as retrieving the book cover, the image for each page index, and the number of pages. BooksViewController.swift is a subclass of UICollectionViewController. This class is responsible for displaying your list of books horizontally. BookCoverCell.swift displays all your book covers; it’s used by BooksViewController. BookViewController.swift is also a subclass of UICollectionViewController. Its purpose is to display the pages of the book when you select a book from BooksViewController. BookPageCell.swift is used by BookViewController to display all the pages in a book. UIImage+Helpers.swift is an extension for UIImage. The extension contains two utility methods, one to round the corners of an image, and another to scale an image down to a given size. That’s all! Enough of the review — it’s time to lay down some code! As you scroll, the cover image nearest the center of the screen grows in size to indicate it’s the active selection. As you keep scrolling, the book cover shrinks in size to indicate you’re setting it aside. Create a group named Layout under the App\Books group. Next right-click the Layout folder and select New File…, then select the iOS\Source\Cocoa Touch Class template and click Next. Name the class BooksLayout, make it a subclass of UICollectionViewFlowLayout, and set Language to Swift. 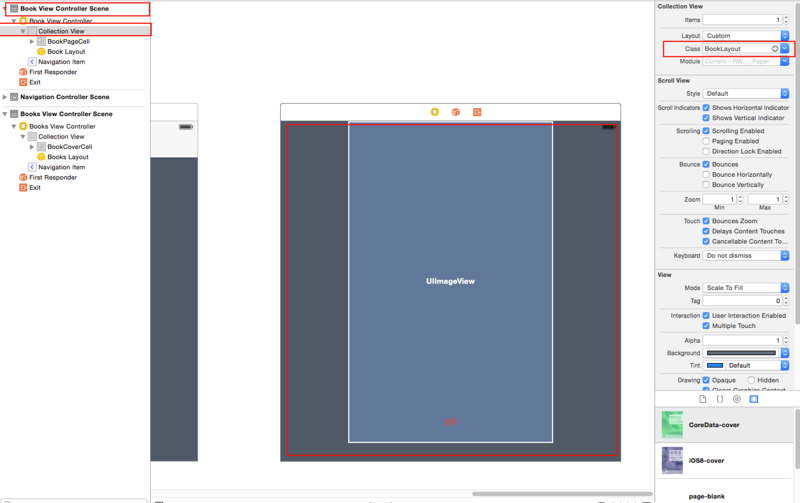 Next you need to instruct BooksViewController‘s collection view to use your new layout. 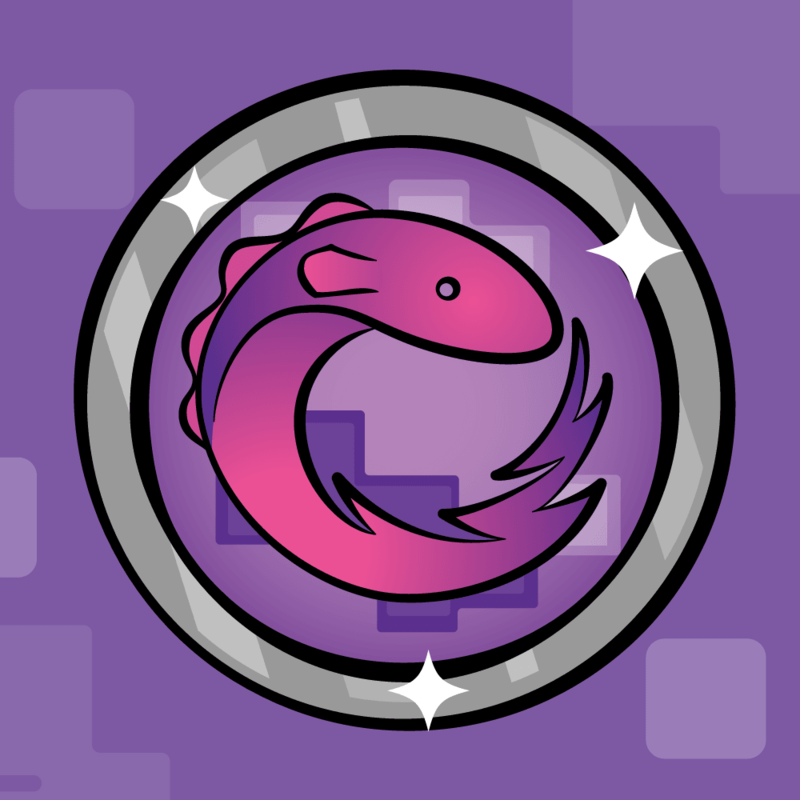 Open BooksLayout.swift and add the following code above the BooksLayout class declaration. These two constants will be used to set the size of the cell. Sets the collection view’s scroll view direction to horizontal. Sets the size of the cell to the page width of 362 and to a height of 568. Set the minimum spacing between cells to 10. //The rate at which we scroll the collection view. prepareLayout() gives you the chance to perform any calculations before you come up with any layout information for each cell. Sets how fast the collection view will stop scrolling after a user lifts their finger. 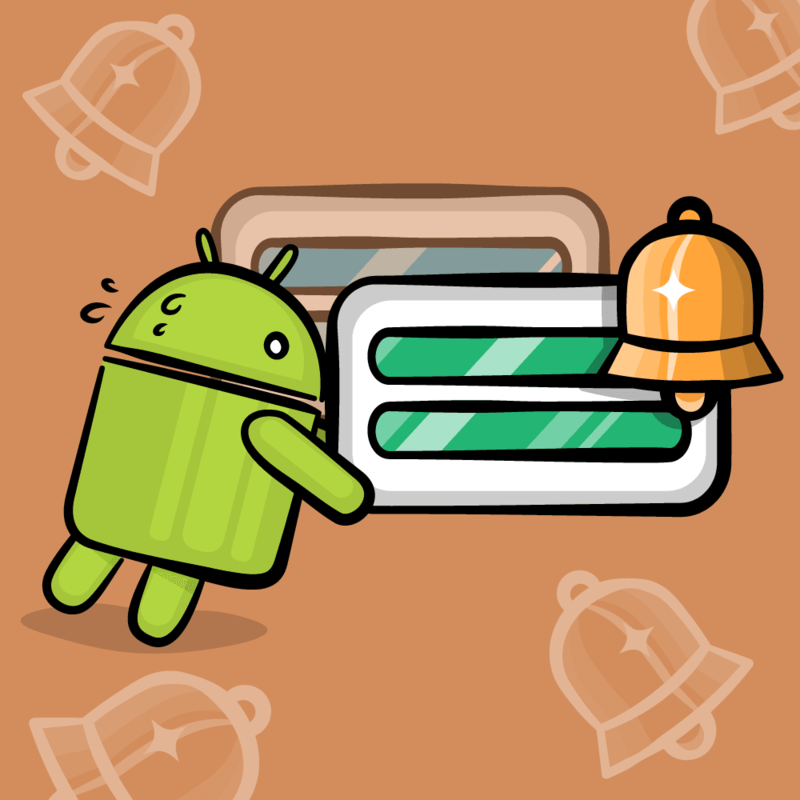 By setting it to UIScrollViewDecelerationRateFast the scroll view will decelerate much faster. Try playing around with Normal vs Fast to see the difference! Sets the content inset of the collection view so that the first book cover will always be centered. Now you need to handle the layout information of each cell. Calling the superclass of layoutAttributesForElementsInRect returns an array that contains all default layout attributes for each cell. Loop through each attribute in the array. Grab the frame for the current cell attribute. Calculate the distance between the book cover — that is, the cell — and the center of the screen. Scale the book cover between a factor of 0.75 and 1 depending on the distance calculated above. You then scale all book covers by 0.7 to keep them nice and small. Finally, apply the scale to the book cover. Returning true forces the layout to recalculate its attributes every time the collection view’s bound changes. A UICollectionView changes its bounds while scrolling, which is perfect for recalculating the cell’s attribute. Scroll through the books to see how each book cover scales up and down. But wouldn’t it be great if the book could snap into place, indicating the selection? The next method you’ll add will do just that! targetContentOffsetForProposedContentOffset(_:withScrollingVelocity:) determines at which point the collection view should stop scrolling, and returns a proposed offset to set the collection view’s contentOffset. If you don’t override this method, it just returns the default offset. Create a new CGPoint called newOffset. Grab the current layout of the collection view. Get the total width of a cell. Calculate the current offset with respect to the center of the screen. If velocity.x > 0, the user is scrolling to the right. Think of offset/width as the book index you'd like to scroll to. If velocity.x = 0, the user didn't put enough oomph into scrolling, and the same book remains selected. 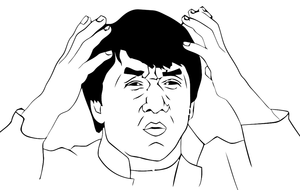 If velocity.x < 0, the user is scrolling left. Update the new x offset and return. This guarantees that a book will always be centered in the middle. To finish up this layout, you need to create a mechanism to restrict the user to click only the book in the middle. As of right now, you can currently click any book regardless of its position. selectedCell() will always return the middle cell. This simply uses the new selectedCell method you wrote rather than taking a book as a parameter. This simply removes the code that opened the book at the selected index; now you'll always open the book in the center of the screen. Build and run your app; you'll notice now that the book in the center of the view is always the one that opens. You're done with BooksLayout. It's time to make the on-screen book more realistic, and let the user flip the pages in the book! Create a group named Layout under the Book group. Next, right-click the Layout folder and select New File..., then select the iOS\Source\Cocoa Touch Class template and click Next. Name the class BookLayout, make it a subclass of UICollectionViewFlowLayout, and set Language to Swift. You'll use these constant variables to set the size of every cell; as well, you're keeping track of the total number of pages in the book. Set the deceleration rate to UIScrollViewDecelerationRateFast to increase the rate at which the scroll view slows down. Grab the number of pages in the current book. Enable paging; this lets the view scroll at fixed multiples of the collection view's frame width (rather than the default of continuous scrolling). Again, returning true lets the layout update every time the user scrolls. This returns the overall size of the content area. The height of the content will always stay the same, but the overall width of the content is the number of items — that is, pages — divided by two multiplied by the screen's width. The reason you divide by two is that book pages are double sided; there's content on both sides of the page. Just as you did in BooksLayout, you need to override layoutAttributesForElementsInRect(_:) so you can add the paging effect to your cells. Rather than calculating the attributes within this method like you did in BooksLayout, you leave this task up to layoutAttributesForItemAtIndexPath(_:), as all cells are within the visible rect at any given time in the book implementation. Create a new array to hold UICollectionViewLayoutAttributes. Loop through all the items (pages) in the collection view. For each item in the collection view, create an NSIndexPath. Grab the attribute for the current indexPath. You'll override layoutAttributesForItemAtIndexPath(_:) soon. Add the attributes to your array. Return all the cell attributes. 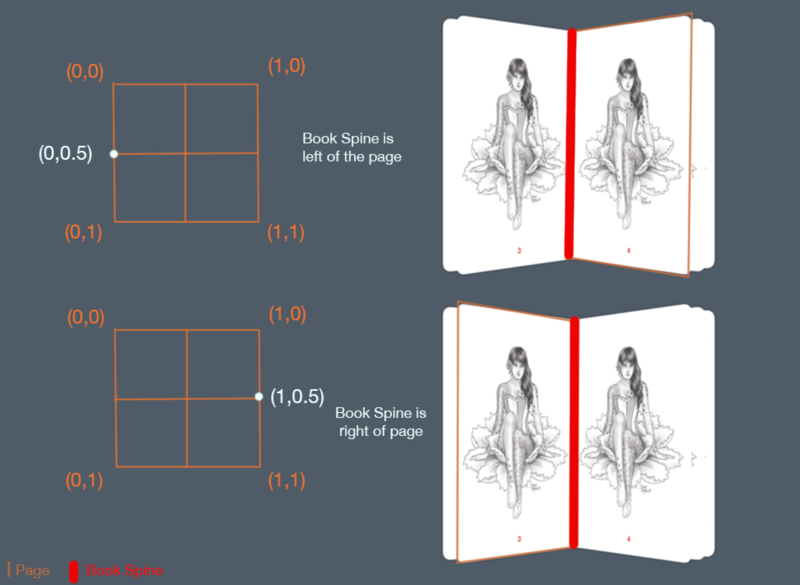 The diagram above shows that every page flips with the book's spine as the axis of rotation. The ratios on the diagram range from -1.0 to 1.0. Why? Well, imagine a book laid out on a table, with the spine representing 0.0. When you turn a page from the left to the right, the "flipped" ratio goes from -1.0 (full left) to 1.0 (full right). 0.0 means a page is at a 90 degree angle, perpendicular to the table. +/- 0.5 means a page is at a 45 degree angle to the table. +/- 1.0 means a page is parallel to the table. Note that since angle rotation is counterclockwise, the sign of the angle will be the opposite of the sign of the ratio. For every page, you calculate the frame with respect to the middle of the collection view. getFrame(_:) will align every page's edge to the book's spine. The only variable that changes is the collection view's content offset in the x direction. Calculate the page number of a page in the book — keeping in mind that pages in the book are double-sided. Multiplying by 0.5 gives you the exact page you're on. 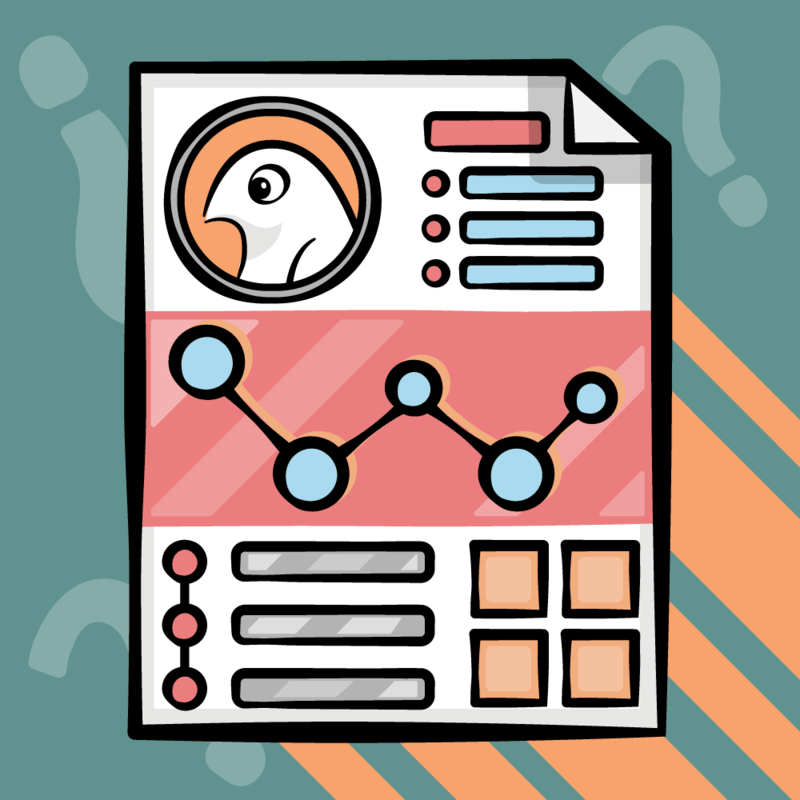 Calculate the ratio based on the weighted percentage of the page you're turning. You need to restrict the page to a ratio between the range of -0.5 and 0.5. Multiplying by 0.1 creates a gap between each page to make it look like they overlap. Once you've calculated the ratio, you'll use it to calculate the angle of the turning page. Check to see if the current page is even. This means that the page is to the right of the book's spine. A page turn to the right is counterclockwise, and pages on the right of the spine have a negative angle. Recall that the ratio you defined is between -0.5 and 0.5. If the current page is odd, the page is to the left of the book's spine. 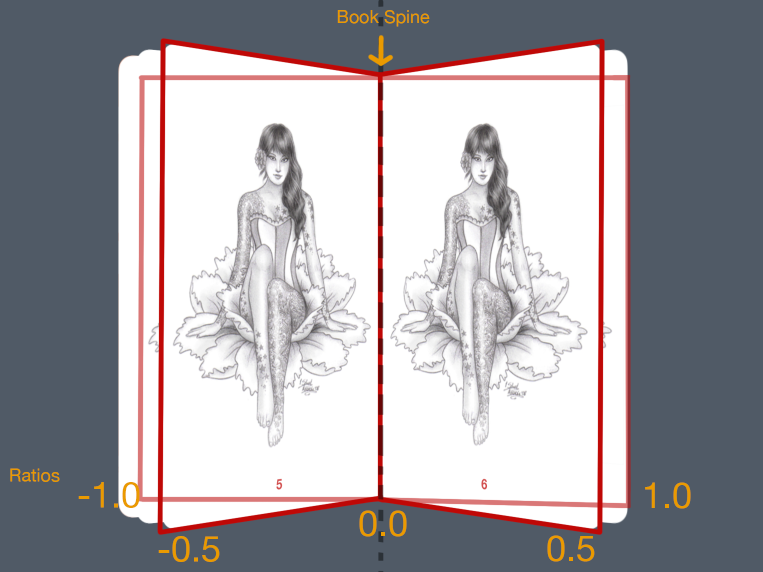 A page turn to the left is clockwise, and pages on the left side of the spine have a positive angle. Add a small angle to each page to give the pages some separation. Return the angle for rotation. Modifying the m34 of the transform matrix adds a bit of perspective to each page. Here you use the two previous helper methods to calculate the transform and the angle, and create a CATransform3D to apply to the page along the y-axis. Create a UICollectionViewLayoutAttributes object for the cell at the given NSIndexPath. Set the frame of the attribute using the getFrame method you created to ensure it's always aligned with the book's spine. Calculate the ratio of an item in the collection view using getRatio, which you wrote earlier. Check that the current page is within the ratio's threshold. If not, don't display the cell. For optimization purposes (and because of common sense), you won't display the back-side of a page, but only those that are front-facing — except when it's the book's cover, which you display at all times. Apply a rotation and transform with the given ratio you calculated. Check if indexPath is the first page. If so, make sure its zIndex is always on top of the other pages to avoid flickering effects. Build and run your app, open up one of your books, flip through it and...whoa, what? The pages seem to be anchored in their centers — not at the edge! As the diagram shows, each page's anchor point is set at 0.5 for both x and y. Can you tell what you need to do to fix this? It's clear you need to change the anchor point of a pages to its edge. If the page is on the right hand side of a book, the anchor point should be (0, 0.5). 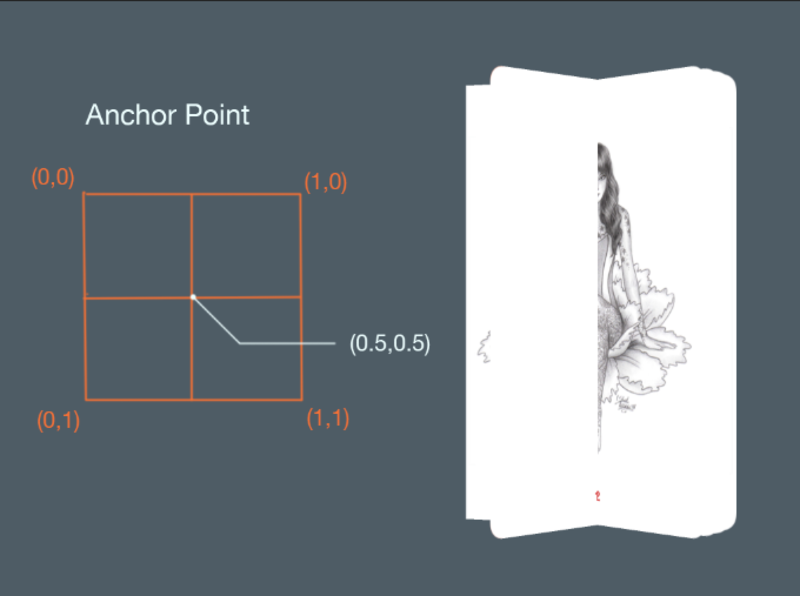 But if the page is on the left hand side of a book, the anchor point should be (1, 0.5). Here you override applyLayoutAttributes(_:), which applies the layout attributes created in BookLayout. Check to see if the current cell is even. This means that the book's spine is on the left of the page. Set the anchor point to the left side of the cell and set isRightPage to true. This variable helps you determine where the rounded corners of the pages should be. If the current cell is odd, then the book's spine is on the right side of the page. Set the anchor point to the right side of the cell and set isRightPage to false. Finally, update the shadow layer of the current page. You can download the completed project from Part 1 that contains all the source code. You started out with the default layouts for a collection view, and learned to customize a new layout to turn it into something truly amazing! Someone using this app will feel like they are flipping through a real book. It's the little things that turn a normal reader app into something that people can feel truly connected with. However, you're not done yet! You'll make this app even better and more intuitive in Part 2 of this tutorial, where you'll explore custom transitions between the closed and opened book views. Do you have any crazy layout ideas you are considering for your own app? If you have any questions, comments or other ideas from this tutorial, please join the discussion below!